Our expert bakers have pulled out all the stops with this protein-packed treat, with an impressive 38g of protein per cookie, and seven scrumptious flavours to choose from. From Double Chocolate to Cookies & Cream, we’ve got a favourite for you. Plus, each delicious cookie contains 70% less sugar and 40% less fat than many supermarket alternatives. You just can’t beat a sweet snack that keeps your training on track. Protein contributes to the growth and maintenance of muscle mass, and that’s vital for absolutely anyone – gym-goers, runners, yoga fanatics – whatever your fitness goals. 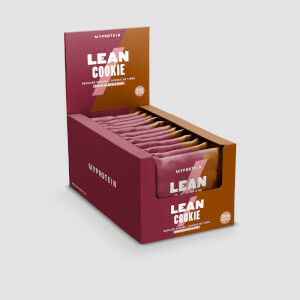 It’s exactly what your body needs to build muscle or tone-up*, and this cookie is packed with it. Plus, each offers 20g of all-important carbs, helping to fuel your workouts, or even just your day. So make sure you’ve always got one to hand next time you leave the house. It’s a cookie! Absolutely any time of the day – they’re perfect on-the-go and for making sure you’re getting the protein you need. Chocolate Mint Flavour: Milk Protein, Hydrolysed Gelatine, Glycerine, Palm Oil, White Chocolate Chips (9%) (Sugar, Cocoa Butter, Whole Milk Powder, Emulsifier (Soya Lecithin)), Soy Protein, Sugar, Reduced Fat Cocoa Powder, Oat flour, Gum Acacia, Raising Agent (Sodium Bicarbonate, Cream of Tartar), Flavouring, Salt, Sweetener (Sucralose). Cookies & Cream Flavour: Milk Protein, Hydrolysed Gelatine, Glycerine, Palm Oil, White Chocolate Chips (8%) (Sugar, Cocoa Butter, Whole Milk Powder, Emulsifier (Soya Lecithin), Flavouring), Soy Protein, Sugar, Reduced Fat Cocoa Powder, Soy Protein Crispies (3%) (Soy Protein Isolate), Oat Flour, Gum Acacia, Raising Agent (Sodium Bicarbonate, Cream of Tartar), Flavouring, Salt, Sweetener (Sucralose). Double Chocolate Chip Flavour: Milk Protein, Hydrolysed Gelatine, Glycerine, Palm Oil, Chocolate Chips (9%) (Cocoa Mass, Sugar, Emulsifier (Soya Lecithin)), Soy Protein, Sugar, Reduced Fat Cocoa Powder, Oat flour, Gum Acacia, Raising Agent (Sodium Bicarbonate, Cream of Tartar), Flavouring, Salt, Sweetener (Sucralose). Rocky Road Flavour: Milk Protein, Hydrolysed Gelatine, Glycerine, Palm Oil, Soy Protein, Chocolate Chips (4.4%) (Cocoa Mass, Sugar, Emulsifier (Soya Lecithin), Flavouring), Sugar, Reduced Fat Cocoa Powder, Marshmallows (3.5%) (Sugar, Corn Syrup, Water, Dextrose, Beef Gelatine, Corn Starch, Flavouring, Natural Colour (Beetroot Red)), Soy Protein Crispies (2.2%) (Soy Protein Isolate), Oat Flour, Fruit Pieces (1.7%) (Concentrated Apple Puree, Strawberry Puree), Fructose, Sugar, Humectant (Glycerine), Wheat Fibre, Palm Oil, Acidity Regulator (Malic Acid), Gelling Agent (Pectin), Concentrates (Black Carrot, Blueberry, Pumpkin), Natural Flavouring), Gum Acacia, Raising Agent (Sodium Bicarbonate, Cream of Tartar), Flavouring, Salt, Sweetener (Sucralose). White Chocolate Almond Flavour: Milk Protein, Hydrolysed Gelatine, Glycerine, Palm Oil, White Chocolate Chips (9%) (Sugar, Cocoa Butter, Whole Milk Powder, Emulsifier (Soya Lecithin)), Soy Protein, Oat flour (Gluten), Sugar, Gum Acacia, Raising Agent (Sodium Bicarbonate, Cream of Tartar), Flavouring, Salt, Sweetener (Sucralose). Chocolate Orange Flavour: Milk Protein, Hydrolysed Gelatine, Glycerine, Palm Oil, Soy protein, Chocolate Chips (6%) (Cocoa Mass, Sugar, Emulsifier (Soya Lecithin)), Sugar, Reduced Fat Cocoa Powder, Candied Orange Peel (3%) (Sugar, Orange Peel, Acidity Regulator (Citric Acid)), Oatflour (Gluten), Gum Acacia, Raising Agent (Sodium Bicarbonate, Cream of Tartar), Flavouring, Salt, Sweetener (Sucralose). I tried the cookie flavour - some people mentioned that they were hard to finish. I had no such experience. It's actually pretty good, just rather not good on the macros. I also tried the lean protein bar at the same time and found that while chewier, it was still fine with much better macros. Excellent taste. Perfect to incorporate into my diet. Highly recommend as nourishing source of protein. The texture is chewy soft, with sandy bits inside (the bits are small, so they feel sandy rather than crunchy). Also, the taste feels a little weird. Artificial. 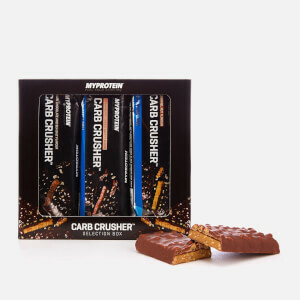 I much prefer MyProtein’s Baked Cookie. 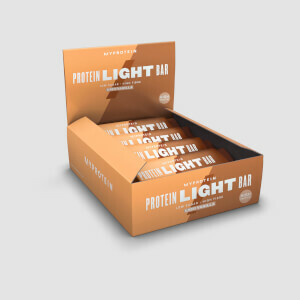 To date, I’ve reviewed twelve of MyProtein’s snacks. These are amazing - both my partner and I both love them and eat one a day. They taste so good and the 38g of protein is fantastic. Great macros. Will continue to purchase. These were awful, they have a bitter/horrible aftertaste, I won't be purchasing these again. These cookies are probably the nicest ‘protein’ cookies I’ve ever had. Aside from the great taste, the thing I love the most about these cookies is the outstanding texture. 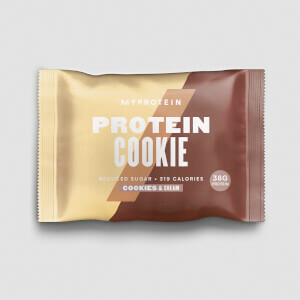 MyProtein seem to have perfected the genuine soft cookie texture, avoiding that dry-dense texture other ‘protein’ products tend to have. Would highly recommend these cookies to anyone! I've bought the double chocolate and the cookies and cream flavoured cookies and the cookies and cream are definitely my favourite. They taste brilliant and really fill you up (if you're running late for breakfast - they're worthwhile to have on hand). Brilliant taste and the protein content is amazing. All round got to recommend!